We want to give a big welcome to Alicia Gorecki, who will be serving as our new Events Co-Manager!! Congratulations, Alicia! We are so excited to have you on board!! Speaking of events… We have a general body meeting AND a happy hour coming up this Wednesday, October 4. Event details can be found below, but duh, you should all come. Location: Arts & Crafts Bar, 1135 Amsterdam Ave. The Environmental Coalition (ECO) will be hosting our first general body meeting and happy hour this Wednesday, October 4th! Please come out to the general body meeting to hear what we are planning for this semester, eat some free food, AND grab some free drink tickets(!) for our happy hour, which will take place later that day at Arts and Crafts Bar from 7-9 pm. Come to either, or better yet, come to both! For those of you ECO members in EE concentration, please take the time to fill out EE’s concentration survey. The survey is looking for YOUR input on what classes, workshops, speakers, etc. you would like to see more of! ECO in partnership with SEA has been advocating for more environmentally focused agenda within our concentration. Your input matters so please complete the survey! You can find the survey here. The deadline to complete it is October 2, 2017 at 11:59 pm ET. The Greenpeace ship, Arctic Sunrise, will be doing an east coast tour of the US and Greenpeace needs your help to make it a success! The Arctic Sunrise is coming to New York City in Brooklyn from Oct. 11 – 16. If you would like to volunteer, please fill out this form. Kate Orff’s activist and visionary work on design for climate dynamics has been shared and developed in collaboration with arts institutions, governments, and scholars worldwide. She is an Associate Professor at Columbia GSAPP and Director of the Urban Design Program, where she coordinates complex interdisciplinary studios centered on urban systems of the future. Her design studios and seminars aim to discover new ways of integrating social life, infrastructure, urban form, biodiversity and community-based change. Learn more about Awakening Our Democracy and view previous episodes here and please register for the event here. 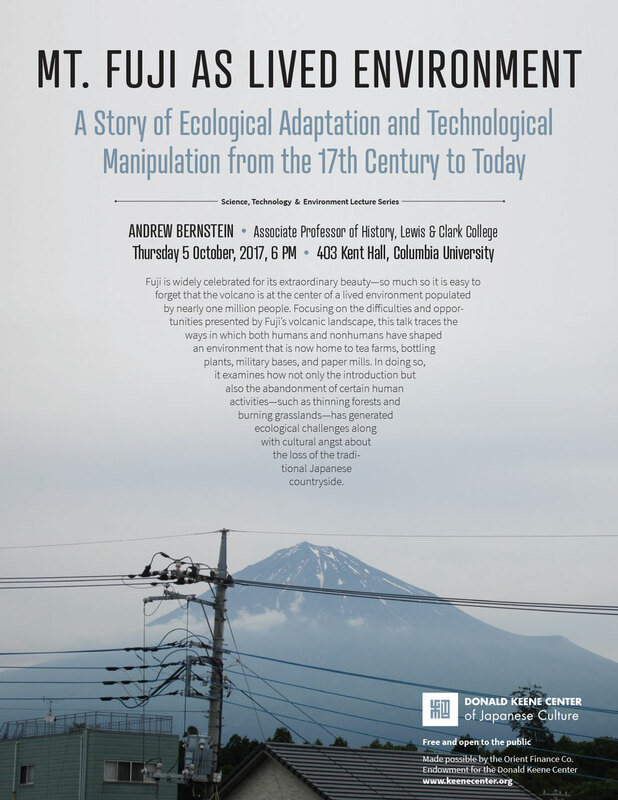 A lecture by Andrew Bernstein (Associate Professor of History, Lewis & Clark College) sponsored by the Donald Keene Center. For a full description of the event, please click here. EDF Climate Corps fellows are part of an innovative network of top-tier graduate students who are working on the ground with leading companies and public-sector organizations to reduce energy use, increase efficiencies, and make the business case for sustainability. Our fellows are hired by their host organizations and work directly with staff from operations, finance and sustainability departments on a wide range of innovative projects. The benefits of being part of the EDF Climate Corps network stay with our fellows throughout their professional careers. Are you up for the challenge? Carbon markets, water quality credits, and mitigation banks are emerging forms of economic exchanges promoted and facilitated by governments as a new means to achieve environmental sustainability. Conservation banks are one of these: based on the regulatory principle of “no net loss” of endangered species on the US territory, they consist in the production and exchange of “species credits” bought by economic developers whose activities impact ecological habitats and species. Neither restraining economic development nor ignoring its negative aspects, environmental banks are trade-offs between economic growth and ecological conservation, cautiously regulated by State and federal agencies. Their expansion reflects a new relationship between environmental sciences, markets, financial instruments and public regulations that ought to be questioned: where does scientific work stand in the making of a market-based policy? Sociology of science provides insights showing how the macro-level of policy design allows for negotiations between scientific accuracy and economic efficiency at the micro-level of policy implementation. Join the Center on Global Energy Policy for a presentation and discussion of the IEA Renewable Energy Market Report 2017 with Heymi Bahar, Renewable Energy Markets Analyst at the International Energy Agency and Project Manager of the Report. Inaugural Fellow David Sandalow will moderate the discussion following Mr. Bahar’s presentation. This report examines how renewable energy in the power, heat and transportation sectors will evolve over 2017-22 in the context of global decarbonization goals. It explores recent renewable deployment, policy, market and cost trends across different regions and countries, particularly as costs for wind and solar PV continue to fall. This year’s report includes additional analysis on renewable consumption of electricity vehicles and off-grid solar PV segment. The Renewable Energy Market Report 2017 also assesses the potential impact of enhanced policy action for the electricity and transport sector under its accelerated case, which would position the world firmly on a path to a more sustainable and secure energy system. Registration is required and can be done here. Guests unable to attend can view a livestream of the event at energypolicy.columbia.edu/watch. A podcast of this event will be available ~5 days after the date of the event through iTunes and our website. Bloomberg Associates is an international consulting service founded by former New York City Mayor Michael R. Bloomberg as a philanthropic venture. We provide pro-bono services to mayors to help city governments improve the quality of life of their citizens. Although we are a philanthropic enterprise, we function and work as a private-sector management consulting firm. Developing an overall sustainability vision that connects to broader themes by diagnosing political opportunities and obstacles, identifying the characteristics that differentiate one city from another, and broadening environmental sustainability to address critical public issues and concerns. Past projects have covered a range of issues including solid waste, air quality, natural infrastructure, neighborhood stabilization/revitalization, energy conservation, public space creation and management, and food policy. The successful candidate will be able to conduct deep analytical work, craft written and powerpoint documents, persuasively engage clients and the public, and manage multiple workstreams. Please find more information about the position and instructions on how to apply here. Corporations Have Rights. Why Shouldn’t Rivers? To stay on top of all our news and events, don’t forget to check out ECO-SIPA.org and follow ECO on Facebook. Click here to join our listserve or forward to a friend.